As I arrived at the school, there were no children in sight; we quickly learned that this was positive because they had already gathered in a large open room in the school and we began the play session. Sitting on various mats and blankets, the children were engaged in exploring games, some had already selected a game and some were still negotiating and browsing the library for the perfect game to start with. There were small, self-determined groups of children gathered around shared games of interest. Each group was made up of both boys and girls with little to no apparent segregation barring age. It was clear, however, that this divide was only due to skill level, as children of all ages moved freely in and out of groups deciding mostly for themselves which games they could play and which would be interesting to them. Once attention was called to our arrival by an instructor at the school, the children all warmly and very briefly looked up to wave and show us their big smiles before returning to their personally determined play projects. Every group worked together collectively to accomplish collective goals, communicating lovingly with one another to ensure that their play time was used to its fullest. Based on the wear and tear of the games, they were well loved (most games were still mostly whole and nearly all were in usable shape, however there was no question that they had been broken in and were used often. Though there were few children older than the age of 10 or so (only two girls in this age range and no boys) the play area was full of children of varying ages indicating that attendance, on this day and among primary and pre-primary aged children at least, was high. Another indication of this was that the children were all clearly schooled. Even the very young ones were using some English to communicate with me and quite easily playing English spelling games, Math games, and other games which required education. 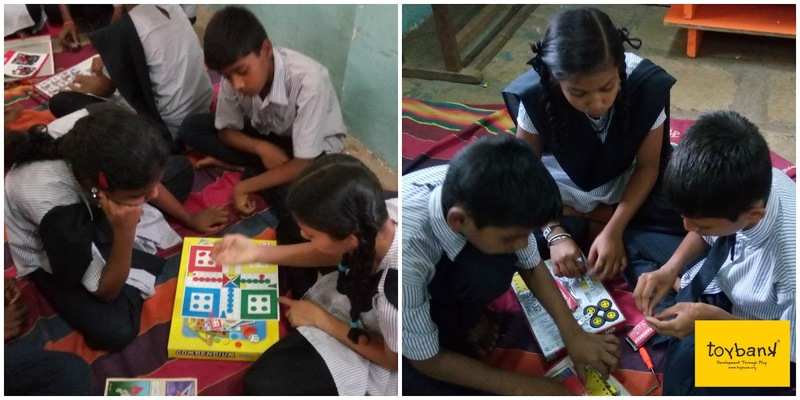 Formal education aside, it was amazing to see how engaged each child was in their games and in socializing with one another. 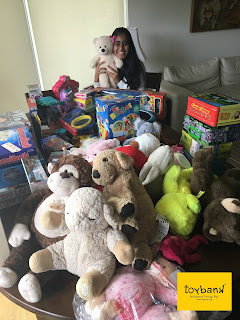 The children all seemed quite comfortable in the playful environment and they were very candid with their instructors and the Toybank representatives. Many specifically requested for us to play with them showing us to where they were stationed and explaining their games to us. The two older girls even gave me a short Hindi lesson (and giggled with me about my struggles with the language)! 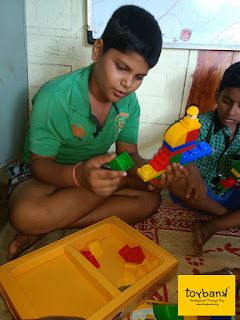 Additionally, all of the children played with many different games while we were there, but it was clear that each child had favorites which they surely discovered by using the variety of games supplied. When it was time for us to leave and for the children to have their lunch we went in to a room with the instructors and shared an Indian sweet made out of lentils and cashews in celebration of one instructors marriage anniversary and another instructors birthday. Though the children did not partake in this mini-celebration, without the brake and the relaxation that the play session provided, I do not think that the instructors could have improved their own work environment and personal happiness in this way. The overall energy and atmosphere in this school during the play session was full of joy, cooperation, enrichment, and life. As we left, several children, still smiling, followed us to wave good bye solidifying the feeling that Toybank provides a crucial outlet and connection to a larger world for these children to expand their knowledge and explore their interests.